It's always a great pleasure to announce publication of a member's book so this time it's quadruply special. Four of the eight authors of Portraits of Our Patriots: Stories of Revolutionary War Ancestors are members of the California Genealogical Society – Millianne (Peirano) Lehman, Linda Longley, Mary Mettler and Terri Taylor. 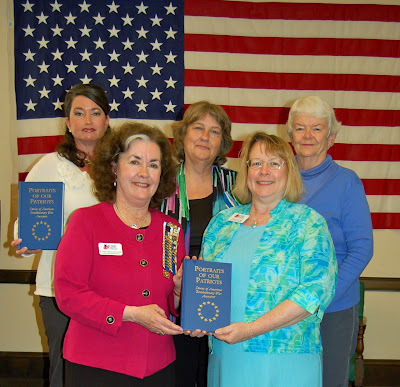 L to R: Annette Litle, Cathy McCausland, Carol Yenne, Terri Taylor and Mary Mettler. Not shown: Joan Evans, Millie Lehman and Linda Longley. The eight writers are members of the San Francisco DAR La Puerta de Oro San Francisco Chapter who tell the stories of fifteen of their Patriots, "recounting with as much detail as possible the events they and their families endured in the years during and surrounding the American Revolution." 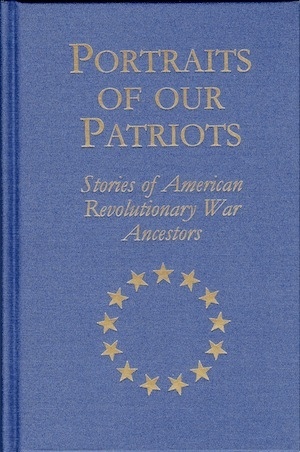 A genealogical summary covering the patriot and his family is provided at the end of each chapter which includes source references. Mary Mettler has generously donate one copy to the CGS Library. She is the author of the two chapters on her ancestors Cephas Kent Sr. and Cephas Kent Jr. Mary chronicled some of her KENT research in as Tuesday Tales for this blog. Congratulations, Mary, to you and all of your fellow authors! There are a limited number available for purchase for $20 plus postage. Proceeds go to the San Francisco NSDAR chapter, La Puerta de Oro. La Puerta de Oro San Francisco Chapter consists of four DAR chapters that merged—the oldest of these, the Sequoia Chapter, was founded on Dec 10, 1891. Their mission is to promote the objects of the National Society of the Daughters of the American Revolution.